The red wine balsamic vinegar is made with a wood barrel-aged Zweigelt red wine vinegar as the base, which was refined with concentrated grapes and chokeberry juice. The dark red color gives your food a hefty splash of color! It has a fruity taste with a delicately tart spiciness. The finish is slightly sweet. 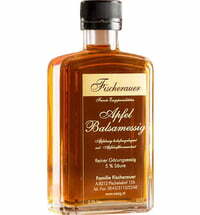 The balsamic vinegar is suitable for all Italian food, red meat and strong salads.